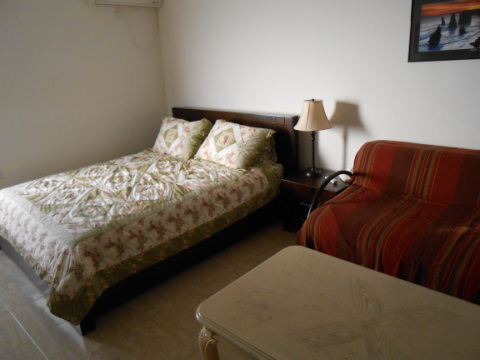 Our guest room in the ancient, mystical city of Tzfat offers a spacious place to rest and relax. Thank you for considering our guest room. 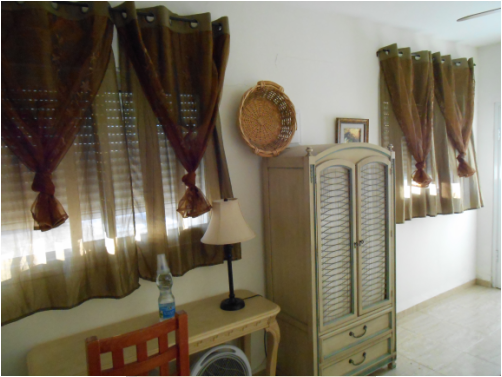 We're a modest family with a simple yet wonderful space that's available for visitors to Tzfat or the Galilee. Explore this web page to see if this is the right place for you. Please feel free to contact us if you have any questions that aren't answered here. You can also call Yaron's phone: 050.874.4275. The balcony overlooking the Kinneret and Tiberius is the perfect place to rejuvenate, meditate, or have some good conversation in our comfy lounge chairs. At night, the city of Tiberius lights up for a spectacular sparkly view. The Tzfat sky with its rarefied air is alight with stars. The air in Tzfat has a different feeling to it. It's been said that Tzfat is close to Heaven and this is one spot where you might just feel that for yourself! 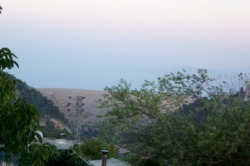 On a clear day the Kineret (Sea of Galilee) shines brightly. At night the lights of Tiberius sparkle. Although it appears to be a nice hike, it takes about 45 minutes by car. A comfy king sized bed for a good night's sleep. 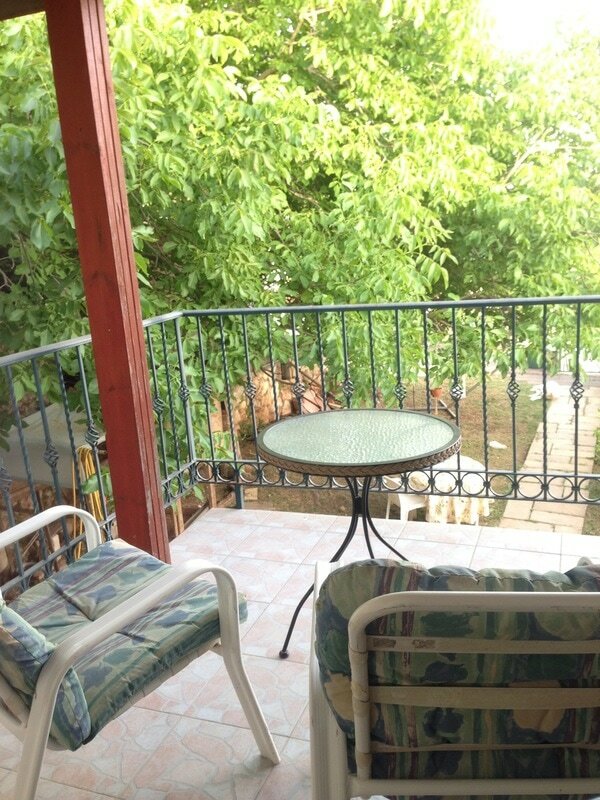 There is a twin sized couch/bed and we can also bring in an extra rollaway bed as needed. This light and airy (no smoking!) room boasts all kinds of homey comforts. There is "mazgan" which means cool air conditioning in the summer and warm heat in the cold winter. There is a kitchenette for your use. Coffee and herbal teas with a kettle for your warm drinks. Do you need something to read during your stay? We'll share our extensive library located in the main part of our home. 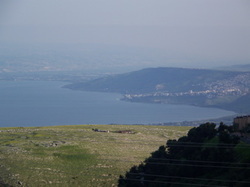 Incredible view of the Kineret. This tzimmer is up a flight of stairs but the size and comfort are well worth the effort. For our returning guests, you'll notice that we are always adding some touch to make the room more comfortable. Our guests have shaped the room with their suggestions and we take all comments under consideration, usually taking their advice. That makes the room more comfortable for all the guests. If you need to create a desk space, we have that for you too! You can see some of the DVD library above the desk. 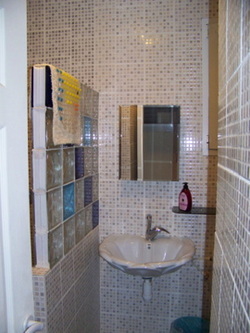 The bathroom is entirely tiled. 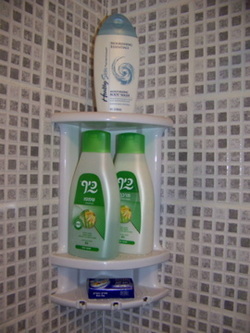 The shower is over sized and luxurious--ready to go from the ducky, no slip bath mat to Israeli products of shampoo, conditioner, your choice of body gel or bar soap, and fresh towels. No matter where you stay in Israel, please know that conserving water is of the utmost importance. Thanks! Coffee (nes/instant) and a variety of teas are at the ready for you morning and night. Please contact us to find out the rates which vary depending on the season. We love kids but the this space is not so kid friendly for little ones who might climb about. We welcome your infant baby who is not crawling yet, or older children past the age of 12. We can usually offer one off street parking space. If you are not coming into town by car, there are several flights of stairs to get to our home. But remember, we've got an amazing view so it's worth it! 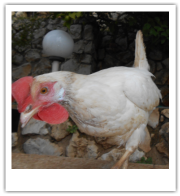 One of our free range hens. Yep. They run about the yard with the dog and cat. We share our yard with three hens, Shasta our dog, and Kitty our cat (Israel has cats everywhere you go, most are feral, or wild. Our cat does not come inside so if you're not a cat lover or have allergies, this is no more of a problem than anywhere else. If you need and want a 'kitty fix' while you're traveling, ours will be happy to oblige!) Our pets do not go into the guest space.